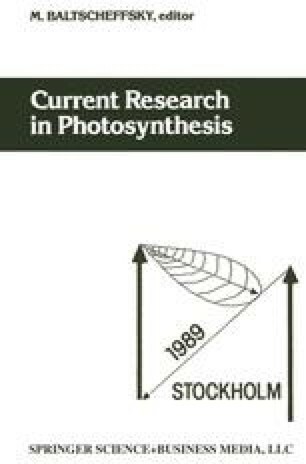 The transthylakoid pH gradient (ΔpH), which builds up during light-induced electron transport, exerts some control not only on chlorophyll fluorescence but also on the intrinsic photochemical yield of PS2 (Φp) (1, 2). Experiments with isolated chloroplasts have clearly shown that this ΔpH decline in Φp is not dependent on non-photochemical fluorescence quenching (3). Instead it was proposed that a ΔpH induced PS2 cycle was involved and in an attempt to understand the mechanism of ΔpH on photochemical and fluorescence yield the effect of pH on PS2 particles has been examined.